The Transcribe! 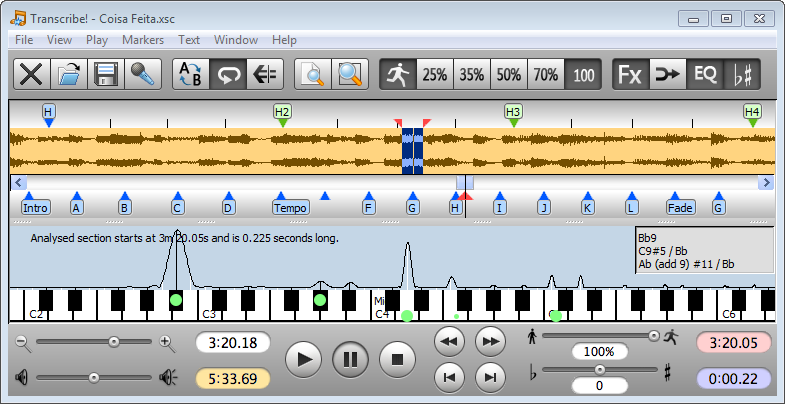 application is an assistant for people who sometimes want to work out a piece of music from a recording, in order to write it out, or play it themselves, or both. It doesn't do the transcribing for you, but it is essentially a specialised player program which is optimised for the purpose of transcription. Transcribe! for Windows has many transcription-specific features not found on conventional music players. ...... It can change pitch and speed instantly, and you can store and recall any number of named loops. There is some advice about this in Transcribe! 's help, under the heading "Various Topics". And it is also used for speech transcription. With its support for foot pedals and its superior slowed-down sound quality, it is an excellent choice for this purpose. There is some advice about this in Transcribe! 's help, under the heading "Various Topics". Qweas is providing links to Transcribe! for Windows 8.21.2 as a courtesy, and makes no representations regarding Transcribe! for Windows or any other applications or any information related thereto. Any questions, complaints or claims regarding this application Transcribe! for Windows 8.21.2 must be directed to the appropriate software vendor. You may click the publisher link of Transcribe! for Windows on the top of this page to get more details about the vendor.